"Cooking for the one you love " is sensuous by its very nature. Never should it be seen as flippant as Cooking is about the art of balance, of feeding the mind and soul as well as the body. For St Valentine, 14 th of February, a day associated with romantic love , your food should arouse passion and leave a lingering taste, a lasting impression.If normally your budget is restricted, it doesn't prevent you from going up- market for this special occasion. and of course you could always substitute the lobster for a cheaper alternative that will work just as well. 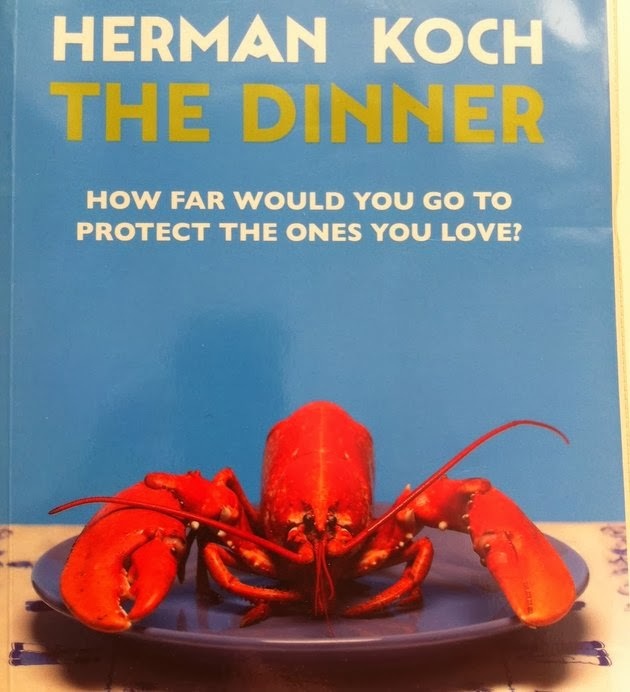 Lobster was my choice after reading Herman Koch's book " The Dinner ". This is a delicious dish whose simplicity belies it's full flavour. Melt 1 tbsp of unsalted butter in a pan, saute the shallot until translucent and place into a bowl. 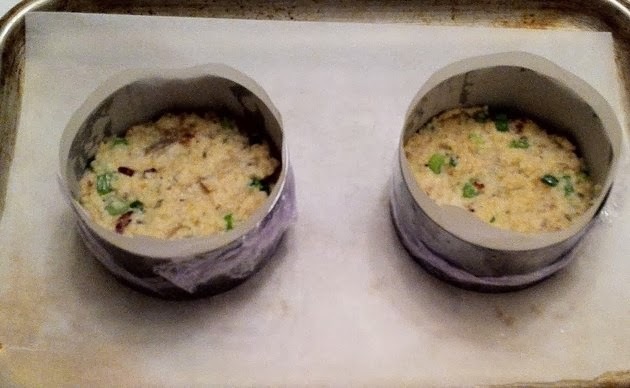 Squeeze out the extra liquid from the bread crumbs and add to the shallot, mix in the white fish and the chopped chives. Season to taste with salt, pepper & cayenne. Mix in the eggs. 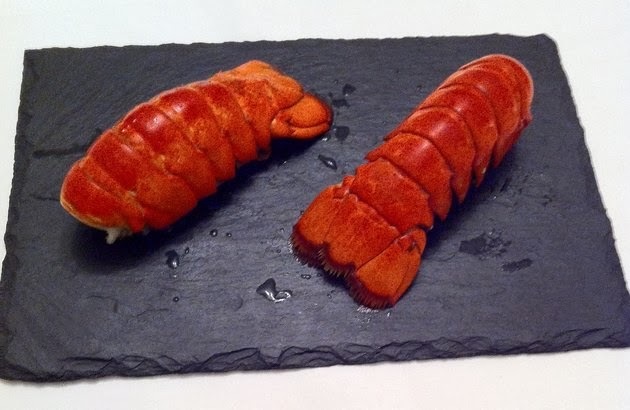 Remove the lobster tails from its shells, reserve the fan tail ends. Slice the flesh in rounds. Line a tray with some grease proof paper. Lined the base of a Chef 's ring from the outside with some good quality cling film. Place onto the tray and slide in a strip of grease proof paper to a height of 1" above the rim. Spoon in some of the fish & bread mixture, layer in the sliced lobster and fill in some more of the fish mix to the rim. Smooth the top with the back of a palette knife. Bake in a pre heated oven at 180 c for 20 - 30 mins until risen and golden. The blade of a knife should come out clean if inserted. Reduce the strained infusion a bit further, add in some cream and allow to boil . Turn down the heat and reduce to a thick'ish consistency. Whisk in some butter to coat the back of a spoon, and season with lemon juice. 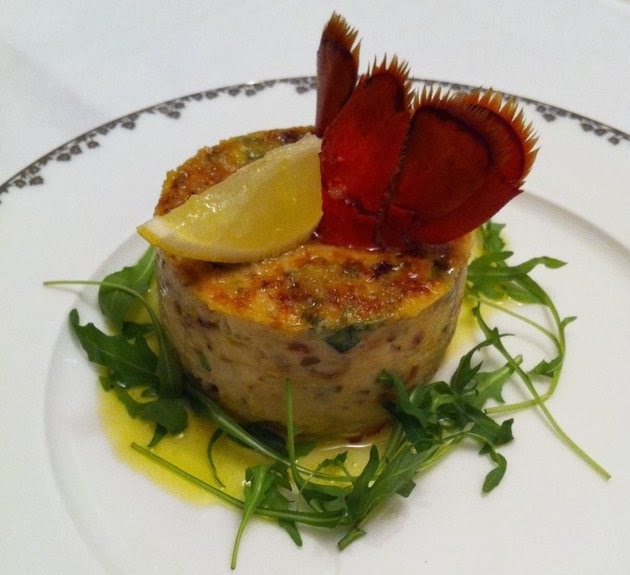 Carefully un-mould your terrine, place on a plate, garnish with the lobster tail , an extra wedge of lemon, rocket leaves and drizzle over the beurre blanc. Fabulous dish and very refined too. Shellfish is my favourite, I could have it everyday! And lobster for Valentine is just the perfect treat! That looks very posh and delicious! Send some to Scotland please!